The MZ3 was the flagship in the MZ series from 1997 until the MZ-S was released in 2001. It is essentially the same as the MZ5 but with a higher top speed (1/4000 compared to 1/2000) and was reportedly launched in silver as a companion to the new FA 43mm f1.9 Limited lens. It is very light as much of the construction is plastic but it has a lovely feel to it, much easier on the shoulder than most other Pentax models. It is difficult to determine exact information about it, as it was only made for limited markets (Japan only?) and never officially released in the US. I believe that the "kit" in the photograph is probably the MZ3 "Limited Edition" boxed kit, there was also a "Special Edition" kit that was the same body but with some gold trimmings and a badge denoting it as the "Special Edition". 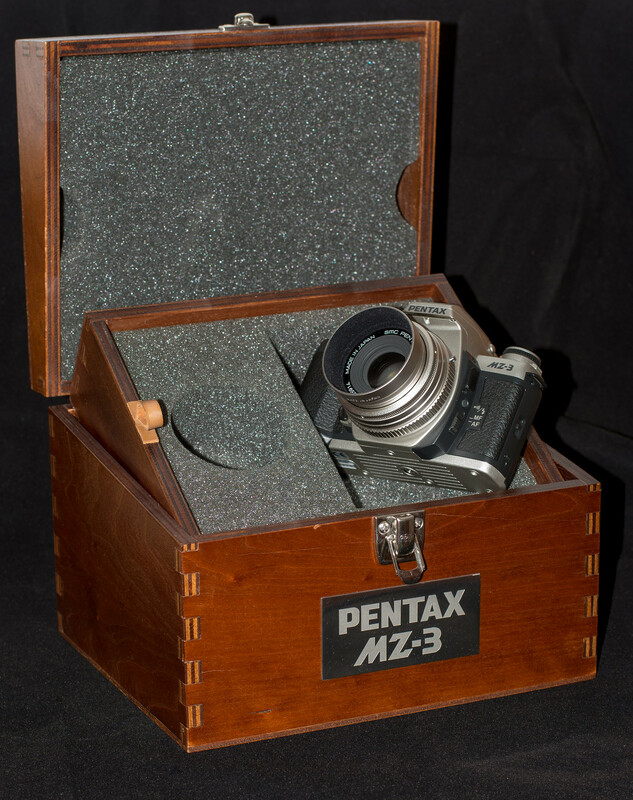 I don't know how many were produced and can only find little snippets of information about the boxed kit - but it was clearly something Pentax were proud of. Any info on it would be greatly appreciated! I once saw a similar Russian box, but they used dovetails (much stronger) instead of comb joints. I have an MZ-3 body in silver, though in this case I'd prefer black. 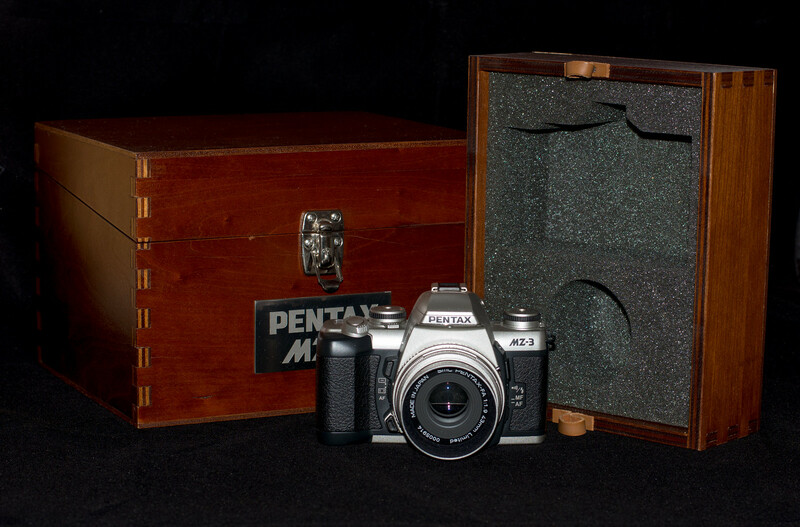 Eric Hendrickson installed the improved motor with metal gear and an MZ-M focus screen. I was wondering of you'd seen it somewhere or if it was actually in your possession. I have a couple of 5Ns which I'm assured have the same build quality as the 3. Nice capable cameras but very flimsy feeling. The set with the 43mm looks nice though. I think the only difference between the 5N and the 3 is the higher top shutter speed and a slightly higher flash sync speed. 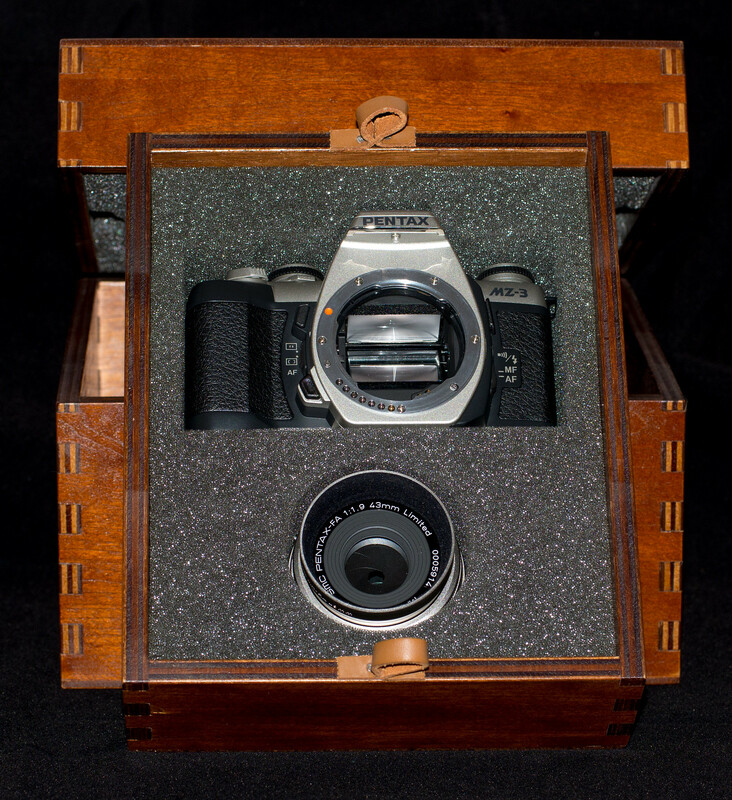 The subject of the "flimsy" and "plastic" build gets mentioned quite often, but it was a time when they were producing lightweight bodies and lenses, which may not have the same feel as the limiteds, but the quality was still very high. I still use an FA 20-35 and an FA 24-90 quite regularly - their quality is superb and you hardly know you have then in your pocket or camera bag they are so light. Lovely set - will make some collector very happy if you do sell it. Wonder how much something similar with such as a K3 would cost today? Isn't it called a K3 ? Being a wood worker I noticed none of you mentioned the beautifully made stained birch plywood box! "In a photographic context I don't like the use of the word 'shot' as where I live this word refers to an extreme act of violence and not the beautiful craft of photography"
Plastic has been mentioned a few times, but the chassis and the film gate were still made with metal. This gave the camera rigidity. They were well made and gave very good service. Yes, until the critical plastic gear breaks and the camera becomes completely disabled. That weak link was the entire model line's downfall. The gear in one of my 5Ns failed a few weeks ago. I have received my order of a few new brass gears from a company in Poland so I'll need to see how it goes replacing it. It seems to be fairly difficult to get to the gear in order to replace it.